What do you lose when you read a book solely on the Kindle? That's a question I've found myself considering while writing this review. I started out thinking this was a fictional cross between an adventurer's story and anthropologist's study: parallel tales of the author, Warwick Cairns, who befriends an elderly adventurer, Wilfred Thesiger, who inspires him to retrace his steps across Africa exploring the area around the Awash River in Ethiopia. Cairns switches between the two journeys: that of himself and some friends, as they travel by bus, car and camel, helped by Thesiger's adopted sons, to visit the old man in his village home; and that of Thesiger, in 1933, travelling on foot through some of the most dangerous territory in Africa, rife with murderous tribal rivalries. It's a riveting read, with some nicely juxtaposed observations about how modern life is rather rubbish; even when it's tough walking through a desert. The author occasionally lapses into tirades against what he perceives to be the ills of contemporary society. I take particular issue with the dishwasher example. My life would be hell without one. And my hands wouldn't be quite so soft. Now, returning to my opening question. 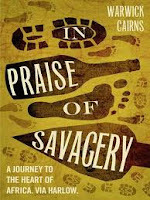 In Praise of Savagery (currently available as a 49p e-book) is published by The Friday Project, and their publisher, Scott Pack, plugged the final day of it's availability as a free download at the recent FutureBook conference. Being a bit of a tight wad, I downloaded it there and then. I had no idea what it was about. I hadn't heard of the author. I didn't know whether it was fiction, illustrated or non-fiction. I wasn't sure what the cover looked like. I didn't know the pagination. It was truly an enjoyable voyage of discovery. So when I came to write this review, I needed to research the book. Turns out it is non-fiction. It has 256 pages. And Warwick Cairns actually did travel with Wilfred Thesiger in Kenya. It's a rather unsettling feeling, getting all my assumptions wrong, but something I guess I'll need to live with as I continue reading on the Kindle. And here's Scott Pack's explanation of the logic of offering an e-book for free before publishing the hard copy. Do you think it will work?